Experience the charms of Galle and Sri Lanka’s southwest coast on a day trip from Colombo, with an expert driver-guide. View endangered turtles at the Kosgoda Turtle Hatchery; see the stilt fishermen at Weligama; and explore UNESCO-listed Galle Fort, where 17th-century ramparts enclose colonial buildings, museums, and shops. Learn about Galle’s maritime history, and visit Talwatte's simple-but-moving Tsunami Photo Museum to chart the impact of the 2004 disaster. Before returning to Colombo, enjoy lunch and discover Bentota Beach. Picked up promptly at 8am at our Airbnb. As we drove to Galle, our driver was excellent telling us about out the history and sights along the 2.5 hour drive. Our first stop were the Stilt Fisherman, they were neat, but it felt a little touristy. The guys were resting in the shade and when we pulled up they scrambled out to the stilts. They did open a coconut for us to drink and also we ate the inside of it. A tip is appreciated.Our next stop was Jungle Beach. It's not hard to get down the beach, (maybe a 10-12 meter trek down an embankment) but if you don't have the right footwear, it'll be a struggle. Great views once down there of Galle, people swimming, glass boats, etc. There are small shop to buy trinkets and have a drink if you want. Next up was Galle Fort. See the guys cliff diving and take pics. Tips are appreciated. Stop at any of the shops or street vendors and browse if you'd like. Once you get by the oldest working Clock Tower, get a picture with the monkeys or watch guys charm snakes(tips appreciated). The views are tough to beat from that area.Next stop was lunch. This was by far the best food we had in Sri Lanka. We drive out of Galle Fort and our driver takes to a little spot off the beach. We secured a beach side table, ordered food, 2 beers, sat and enjoyed the views and the breeze. Our next stop was the Tsunami Museum, it was actually a small house ravaged by the Tsunami that had tons of pictures, child missing notices, death toll, etc...its not for the faint of heart, but its definitely a must see. Donations are appreciated.We left the museum and headed to the Herb Garden. They gave us a small tour of all the local plants, herbs and the medicines they make out of them. I was quite surprised at this stop as I was just expecting some lame plants, trees and flowers. They ended up giving us a small foot massage and you could buy any of the medicines they make. The guys don't take a salary, so most proceeds go to them and the upkeep of the garden. Needless to say, donations are appreciated. Next stop was the Mask Museum, quite an odd short tour and donations are appreciated. The best part about this stop was the retail shop. Tons of quality handmade items to buy. Cash only though.Last stop was the Turtle Hatchery and Conservation. Great little stop where we shown turtles at all stages of growth, even 1 day old! There is a big shop to buy items, but a bit overpriced. A tip is appreciated for turtle guide.Anyhow, bring money. Very enjoyable. We really enjoyed the peace temple. The lunch was delicious. Great tour, excellent service!. we visited Galle in mid November. Amazing guide, knew everything there is to know about each site we visited and took the time to explain everything so that we could learn as much as possible about the places we are visiting. Driver also great, very polite, comfortable car, provided free water during entire journey. We felt treated like family! Great job guys! Thank you again! This tour is a must if you are visiting Colombo. Our guide Deshan was great! He could speak English very well, kept us informed of the day's events and generally attended to our every need all day. Bottled water is provided and the air conditioned car was excellent on the hot day. Deshan was a wealth of information and answered all our questions. The highlights for the day included the Tsunami museum, Galle Fort, Herbal Spice garden and Turtle hatchery. In future I will make a note of Viator Top Rated tours when choosing as this was definitely one of the best ones to do. Thank you Deshan for making our Gall day trip so memorable. This tour delivers what it promises. The company, Sanota Walkers, organized it to perfection. The driver/guide was very friendly and competent. So yes, highly recommended. 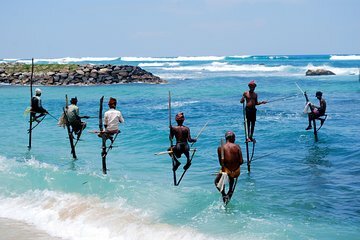 one day trip to Galle from Colombo is overall good with visits to Stilt Fisherman, Fort, Mangrove boat ride, Spice Garden and Tortoise hatchery with a superb buffet lunch.the trip is fully engaged and we enjoyed the trip. The driver was more accommodate and friendly. i highly recommend this tour. I went with my parents for this day tour, and Chiranga was our driver and guide for the day. We truly enjoyed the tour from the start to the end. Wonderfully planned itinerary that covers a range of activities to see and do in the South, and although the day was packed, we did not feel rushed at any of the attractions. We particularly enjoyed the Galle fort and the Turtle Hatchery. Chiranga was an excellent guide, humorous, always willing to share his experience and knowledge about the various attractions. I would definitely recommend this tour, good job Sanota Walkers! Our Galle Day Trip is also great, we have visited the Fishermen on Stilts, Galle Fort, Tsunami Museum, We have a great time with the river tour and even visted the Cinnamon island, it is very refreshing, We have a nice lunch near the sea and we also visited the Spice Garden and have a nice sample massage, after that we went to Turtle Hatchery conservation. After the trip Chamika drive us to the Airport. Thanks Chamika for the great job! I highly recommend Sanota Walkers! Chamika was an excellent guide, and he was also a safe driver. We got to see stilt fishermen, local temple, Galle fort, the tsunami museum, a hidden jungle beach, a private river safari, and much more. It was a very intense but fun day! A lot of impressions! We are very glad we did this tour, and strongly recommend it!